Looking for a magazine that speaks to the issues that matter most to you, a Presbyterian woman? If so, look to Horizons, the award-winning magazine devoted to the mission and purpose of Presbyterian Women. The theme of this issue is ""Literature and Theology."" 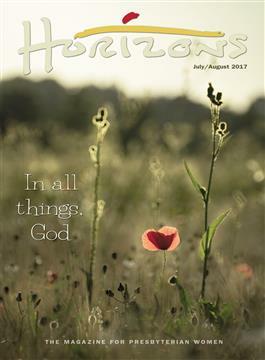 This issue also has Bible study resources for Lessons One and Two of the Horizons study Cloud of Witnesses; the 2017 Thank Offering recipients and dedication service; articles on theology and literature; and the usual departments that share how PW are building community, nurturing faith, supporting mission, working for justice and peace, strengthening the church, and more.